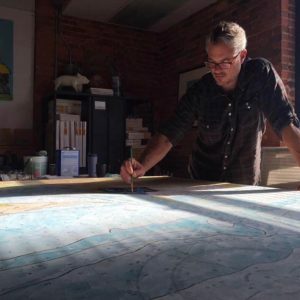 Born in Hingham, MA in 1971, and raised on the South Shore of Boston, some of Minkin’s earliest memories of creating art were childhood moments spent doodling on the back of a placemat at a restaurant or in a sketch book on a boat to Nantucket. For Minkin, being an artist wasn’t an option; it was a given from an early age. After graduating with a BFA from Skidmore College in 1993, Minkin continued his education at the Museum School in Boston, earning his MFA through Tufts’ program in 1996. He had the opportunity to study under one of his biggest influences and mentors, Carroll Dunham, who revered Minkin’s bold, whimsical style and strongly encouraged him to pursue a career in the arts. For his final thesis project, Minkin produced a series of extra large abstract maps, a theme that still serves as inspiration and subject matter for his work today. Minkin spent a decade living and experiencing life in Miami, New York, San Francisco and Chicago and traveling internationally before returning to Boston in 2006. Many of the recurring themes in Minkin’s work harken back to his days near the water, bearing witness to the beauty and serenity of his surroundings or particular objects, and to sentimental thematic impressions, and their reinterpretation into evocative works of art. Minkin has worked closely with many founders in the technology and innovation world and is fortunate to count a number of high profile tech and business leaders among his clients and collaborators, including a 10 year stint as the “Artist In Residence” for BzzAgent. Minkin created his own work for sale in his studio within DunnHumby’s offices at 500 Harrison Ave in the South End of Boston, and was a significant contributor to several of the firm’s most successful projects and events. In 2008, Minkin was selected to be the creative voice for “Military One Source,” a Department of Defense program for veterans. Over the course of 12 months, he was commissioned to create a series of 20 oil on canvas originals that were used in various print, internet and television advertising campaigns, running between 2008-2010. Minkin has also collaborated with several makers of consumer goods, including a line of watches by Montana Watch Company, rendered in the finest metals and gem stones, based on his oil on canvas originals. In 2016, he joined forces with Castaway Clothing Nantucket, to create a unique and fun swim suit, based on his ongoing “Sardines” series. In December of 2016, Minkin opened Seth B Minkin Studio + Showroom in South Boston, his ideal environment to make and show his signature paintings. Open by appointment only, to maximize privacy and the personal, intimate nature of each experience, Minkin’s studio is the perfect vantage point to witness him work, and to see each piece come to life, from inception to creation, in his bright and tranquil space.